The “uncanny valley” is one of the frustrating paradoxes of robotics. Every year, roboticists make humanoid robots that more accurately imitate human beings, but it turns out that the better the imitation, the creepier the end result. It’s that strange, hair-raising sensation one gets when visiting the Hall of Presidents at Disneyland. True, George Washington and Abraham Lincoln look very lifelike, but there’s always something wrong that you can’t quite describe. In the hope of bridging this valley, a Disney Research team in Zurich, Switzerland, has invented a new robot-making technique dubbed “face cloning.” This technique combines 3D digital scanning and advanced silicone skins to give animatronic robots more realistic facial expressions. Facial cloning sounds rather alarming, but its purpose is very straightforward. Basically, it’s a way of scanning a person’s face in 3D and then using that information to design and fabricate an artificial skin that will move much more realistically – not just in general, but as a close imitation of the original person right down to the wrinkles made while laughing. The process uses scanning and digital processing techniques already used in the creation of CGI characters. This isn’t surprising, since animatronics and digital animation both have the same goal of creating realistic characters. However, animatronics is different because it uses soft materials fixed to a rigid skeleton that moves the “skin” around it. Over the past fifty years, there’s been a lot of success in creating humanoid robots, but the results have not been as realistic as desired. Worse, the method for designing and constructing animatronic characters are expensive and labor intensive. The Disney team’s goal was to produce a single skin that can reproduce the vast range of human expressions and to automate that process as much as possible. The process they developed starts with using motion capture technology to scan a person’s head while the subject runs through a “performance” of various facial expressions. 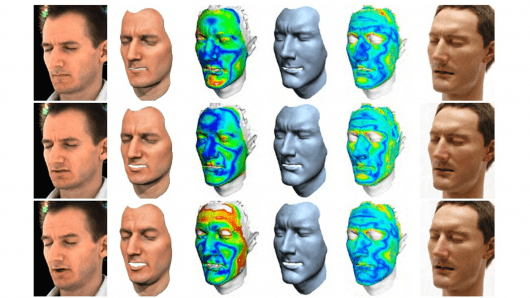 The resulting 3D scan is then used to produce a digital “mesh” – a sort of map of the face. This is used to design what the team called an optimized model of the robot head. This model defines the robot’s range of movements and locates the optimum points to attach the artificial skin. The model also allows the researchers to select the best composition of skin. Disney isn’t aiming to reproduce many properties of real skin because its goals are output based. In other words, the key objective is that the robot looks right. This means that Disney can use silicone rubber skin instead of more realistic alternatives that may behave more like the real thing.